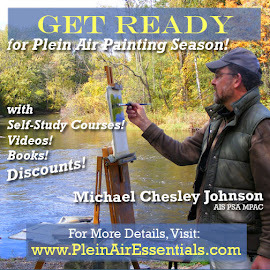 Sign Up Now for Plein Air Painting Maine Workshops in Summer 2019! 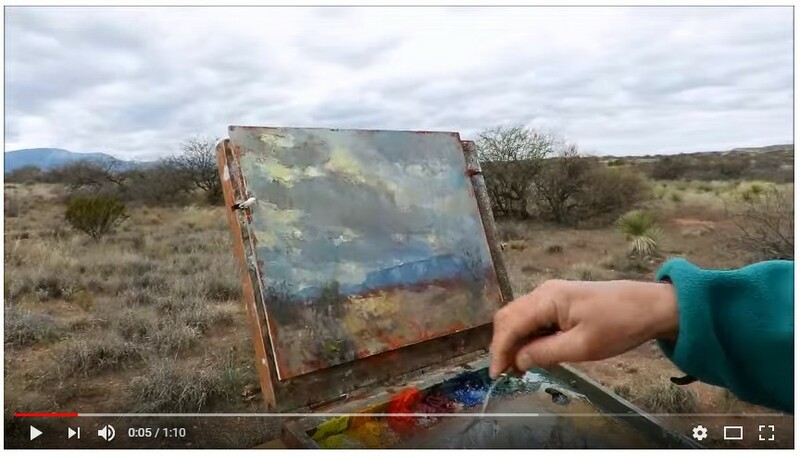 Sign Up Now for Paint the Southwest Plein Air Painting Retreats & Workshops in Fall 2019! Yes, we do get snow here in the mountains of New Mexico, and even though it's been sunny and warm (50 degrees yesterday), some of the snow remains. Unlike back east, where one has plenty of humidity to wrap the warmth around into the shadows to melt it, here there's not so much of that, and little of the warmth we've had affects the snow there. This means I'm able to get out and paint snow while wearing a thin coat and no gloves. In my last post, I showed you my plein air pastel kit from Blue Earth. 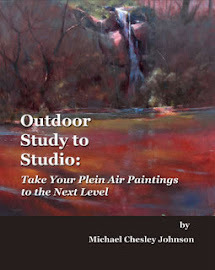 This time, I want to show you my plein air oil kit from Guerrilla Painter. I've had this little 6x8 thumb box for a long time, and I like to pull it out of my closet when I want to paint as simply as possible in oil. Although it's called a "thumb box"--and you can certainly stick your thumb in it and balance it on one arm--I find it too heavy for that to be comfortable. I prefer to either sit with it in my lap or perch it atop a tripod. This week, I used the tripod. piece; the one on the Guerrilla Painter web site is a little different. My set up is really quite portable: tripod, a lean roll of paper towels with two brushes stuck into it for transport, and in my thumb box, a "Mighty Mite" container for Gamsol, a tube of Gamblin's Titanium-Zinc White and a tube of their Galkyd Gel, plus a small painting knife. I prep the palette before I go out with just three colors plus white (Gamblin's Hansa Yellow Light, Naphthol Red and Ultramarine Blue.) And that's it! Oh, and sunglasses for all the light bouncing off the snow. I've included in this post two paintings I made this week in the snow. Subscribe to Michael's Small Paintings! This and my other books are now available through Amazon! Click the image. Also available for the Kindle. "Small Workshops for the Serious Student"
Videos Available from North Light! Gallery Pieces Available for Purchase! All Contents Copyright © Michael Chesley Johnson. Powered by Blogger.